A decision by Nick Clegg to join forces with David Cameron would provide an opportunity for a major electoral revival by Labour at a second election in 2010. A briefing paper published today by the Fabian Society shows that a decision by Nick Clegg to join forces with David Cameron would provide an opportunity for a major electoral revival by Labour at a second election in 2010. It would also place many Lib Dem MPs in danger of being unseated. If the Lib Dems team up with the Tories it would be a betrayal of the expectations of many progressive voters who voted Lib Dem last Thursday. Many supported the Lib Dems in the belief that they were a progressive, liberal party of the centre-left. Many more will have voted Lib Dem as a way to keep the Tories out. • 43% of Lib Dem voters described themselves as centre-left or left, compared to 29% who described themselves as centrist and just 9% who described themselves as centre-right or right. • 39% of Lib Dem voters described the Liberal Democrat party as being centre-left or left, compared to 33% of Lib Dem voters who described the party as being centrist and just 5% who described the party as being centre-right or right. This suggests that somewhere between a third and a half of Lib Dem voters could find themselves alienated if Clegg teams up with the Tories. Our analysis shows that this alienation of progressive Liberal Democrat voters from a Liberal-Tory pact would suddenly put scores of seats into play for the Labour Party at a second election in 2010. As the table shows, there are 15 Lib Dem seats that would fall to Labour if just one-in-five of their voters switched to Labour. These would include all five gains that the Lib Dems made from Labour on Thursday night – Norwich South, Bradford East, Brent Central, Burnley and Redcar. Several Lib Dem MPs, including frontbenchers Sarah Teather and Jo Swinson, are even more vulnerable, falling if just one-in-ten Lib Dem voters defects to Labour in protest. What is more, the analysis shows that in many other constituencies Labour could take a large number of seats back off the Conservatives with relatively modest defections from the Lib Dems to Labour. At a national level, the Lib Dems have positioned themselves as opponents of the Tories for the last two decades. A Lib-Tory pact would make Labour the sole source of opposition to the Conservatives in many seats, allowing Labour to persuade many former Lib Dem voters to switch to them. There are 25 seats that would swing back from the Conservatives to Labour if just one-in-five Lib Dem voters in these seats switches to Labour. These would include many seats in the South and the Midlands that Labour lost at the General Election, such as Hendon, Thurrock, Broxtowe, Bedford and Hove, as well as the Tories’ prized gain in the North East, Stockton South. Fifty-five seats would swing back to Labour if one-in-two Lib Dem voters in these seats switched to Labour. Though a tall order, along with seats taken off the Lib Dems, this could be enough for Labour to regain a majority at a possible second election in 2010. Finally, our briefing points out there are also many seats, especially in the South and South-West, where Labour is in third place and could leapfrog the Lib Dems into second place, to provide a platform for future electoral gains. In many seats around the country, both Labour supporters and non-aligned progressives voted for the Lib Dems to keep the Tories out. They will now be scratching their heads if the Lib Dems form a pact with the Tories. So a Lib-Tory pact would provide a huge opportunity for Labour to re-establish itself as the opposition to the Tories in these seats. Indeed, the need for action here is urgent: according to the website UK Polling Report, whereas after the 2005 election Labour was in first or second place in 499 seats, after the 2010 election, Labour is in first or second in just 418 seats, a fall of 81. While an objective of moving into second place in more constituencies will not deliver any extra seats for Labour at the next election, it is essential for rebuilding Labour’s base in the south of England over several electoral cycles. If revival in the south of England is only considered one-election-at-a-time, it means the only strategy available is a fight over a segment of Conservative swing voters in those seats where Labour are second. Important though it is to regain the support of these voters, a more ambitious approach will ultimately be needed, one where Labour fundamentally reshapes its identity in the south of England to become the source of popular opposition to the Conservatives in a way that it has surrendered to the Liberal Democrats over the last few decades. Of course, a Labour recovery will require hard work to recapture those voters who turned to the Tories last Thursday night. But it is important also to note that a Lib-Tory pact would offer the prospect of significant electoral recovery for Labour even before it gets back a single Tory voter, by allowing it to eat into the Lib Dem vote in many constituencies. It is an opportunity Labour should seek to grasp ahead of a possible second election in 2010. There are some Lib Dem supporters who understand that their party is centre-left AND (not but) has formed a coalition with the tories. In doing so their party has shifted the centre of gravity within the government to the left (compared to a pure conservative government). They have won many tangible commitments in the coalition agreements which would have been unthinkable under a pure Tory government – so some Lib Dems voters even from the far left might on this basis conclude that their votes were far from wasted. 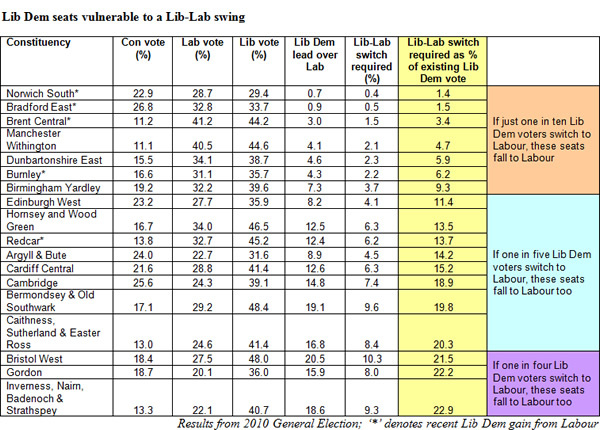 ComRes poll finds 1-in-3 who voted Lib Dem in May would now vote Labour. http://ow.ly/2AdDZ that's why they are changing constit boundaries. I think history has proved that the Fabians are wrong to have urged alliance with the SDP/Liberals/Lib Dems at every opportunity, and perhaps the time has come for them to realise that the only way we will get progressive politics is if we in the Labour party actually fight and legislate for it. We cannot and should not allow third parties to dilute what is best for our country.